The Whistler is an issues novel that uses the framework of a legal procedural. In his recent Grey Mountain, Grisham took on the coal industry, in The Whistler it is the Indian-run casinos and the range of social and political issues that they raise. But in focussing too much on the issues and the path to their resolution, he loses sight of the need to for a legal thriller to thrill. An informant (the whistleblower or ‘whistler’ of the title) brings a potential corruption case to the attention of the Florida Board of Judicial Conduct. The allegation is that a Florida judge has been working with an organised crime gang and has been instrumental over the years in helping establish and then keep in business a casino on Tappacola land. This not only included favourably ruling on land deals but also possibly having an innocent man sentenced to death in return for a cut of the casino profits. For BJC Investigator Lacy Stolz and her partner Hugo Hatch, this investigation promises to be the most far reaching of their careers. But as they start to investigate they soon find themselves well out of their depth and a target of criminal forces. Despite some of the trappings of a thriller, The Whistler is rarely anything but a legal procedural. A combination of Board of Judicial Conduct investigation into a potentially corrupt judge and the FBI investigation into the organised crime group that she is working for. Grisham takes readers through the investigation – the lucky breaks, the building of a case, the presentation to the grand jury, the turning of key witnesses – step by step, occasionally providing the criminal’s point of view to solidify or explain some aspect of the plot. While there are undoubtedly some tragic and tense moments as the case builds, Grisham never loses sight of the legal processes that need to grind away to achieve a result. This tale is made readable by Grisham’s experience in delivering an accessible description of those procedures, the way they operate and the complex web of corruption they are uncovering. His main characters, including Lacy, a strong middle age single woman are well drawn but have limited roles outside of furthering the investigation. And it is left to the minor characters including Lacy’s obnoxious but well resourced brother Gunther and her mysterious informant Greg Myers to add colour to the narrative. 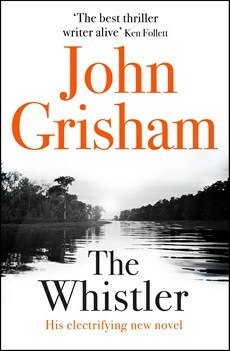 The Whistler is John Grisham’s twenty-ninth legal thriller and once again shows that the formula which he practically invented in his early books – a combination of social commentary, legal shenanigans and fairly low key action that occasionally generates real thrills – is still working. But in The Whistler that formula doesn’t quite fire as it used to. Because after setting up for the bang of a thriller, The Whistler’s end game becomes a lengthy legal procedural whimper.